Did you know Core offers Pilates Reformer sessions right in our newly updated clinic? Learn more here about Pilates Reformer and give us a call to set up an appointment. Anyone interested in Pilates! Whether seasoned or new to the practice, the reformer can help strengthen your core, lengthen muscle groups, and work new areas of the body. And we can tailor exercises just for you based on where you are, fitness-wise, and your personal fitness goals. We promise this isn’t a torture device. Consisting of cables, bars, straps and pulleys, the reformer supports exercises from a variety of positions, from seated to standing to in between. The resistance created by the pulley and spring system can provide a challenging strength and endurance workout, working arm, leg and abdominal muscles. Call us to schedule a one-on-one session during our office hours. 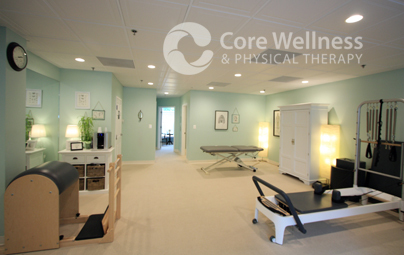 At the Core clinic, right in the heart of Del Ray on Mount Vernon Ave near Del Ray Pizzeria. And come see our newly updated space! Why not?The time is right. Lengthen and tone your body not just for summer but for overall strength and wellness throughout the year. And because we’ll be working with you one-on-one, we can help you discover the exercises that best fit your body’s needs.